Last Thursday I took a whole day off and waited for 11 hours in the... well... blistering warmth of Westfield Shepherd's Bush for the premiere of Captain America The Winter Soldier . Well, it's the Monday after, and today I only waited two hours in what really WAS close to the blistering cold to photograph the premiere of The Muppets sequel. Several humans and not one but THREE muppets were expected to be in attendance. If ever I wanted to have a cute AAA pass at a premiere, it would be this one. The man with the incredible (nay, amazing) (nay, spectacular) hair is Steve Whitmire, who is the puppeteer who performs as Kermit the Frog (plus some other characters) in the movie. "I feel violated" Well, it's probably nothing compared to what how violated I personally stand to be if Disney tracks down this journal entry. I'd better add an 'allegedly' in front of 'Kermit the Frog' in the above comment. Meanwhile, I think this might be Matt Vogel, who operates the Evil frog Constantine... either that or Miss Piggy. But more importantly, what's the deal with puppeteers having amazing hair?? Possibly the first movie premiere ever where the first three attendees on The List weren't human. "And you're really sticking with 'I need it for the broadcast'? Because I can tell you right now there's about four better lies you could be telling that wouldn't make you hand it over" I can think of one, myself. Well... there's something you don't see every day. Three Muppets in a cab. I've also photographed The Queen's and Prince Charles' Bentleys. These windows might actually have been cleaner. Wait... I'd better not get Disney AND the Royals offside in the same journal. I'll throw in an "allegedly" here, too. Our first entirely bipedal and entirely human cast member has arrived! It's Ricky Gervais - last photographed way back in the day at the premiere of Night at the Museum 2 . Ah, those were the days when Yellow Cap Guy still ruled the Earth. "It's a sequel/crossover script for The Muppets Meet Fraggle Rock. Could you put in a good word for me with director James Bobin?" "Jeff? Scowl at this man for me, please. I don't want to break his heart"
Ty Burrell has a face that seems very recognisable, but a scan of his works on imdb reveals that I've seemingly only seen him in Zack Snyder's 'Dawn of the Dead', unless I managed to see him passively on Law & Order SVU. Or The Incredible Hulk. Or Fair Game. Or something called "Goats" (2012). Or possibly just this premiere, over an extended period. The Gang assemble. And depending on how much of 'the magic' you want to preserve, ....either three men are crowded really close together inside that box/stage... or they aren't. Getting eye-contact with Miss Piggy is about as difficult as getting eye-contact from any lead actresses in a movie at a premiere (ie. very). Serious kudos to the puppeteer ('Muppeteer'?) who handled her - she stayed in character as a diva throughout the premiere, which was rather cool. "OMG - you're that careers counselor back in High School who said that I'd never amount to anything! Hey, Other Green Frog Who's Not Kermit, scowl at this guy for me!" "Once the Frog has stopped scowling, I have nothing more to say to you"
James Bobin is the writer and director of this film, just as he was the prior Muppets movie. He's also been a writer/director on the TV shows Flight of the Conchords, which I haven't watched; and The Ali G show, which I'll admit or deny having any knowledge of depending on how cool I'm trying to be and to whom. 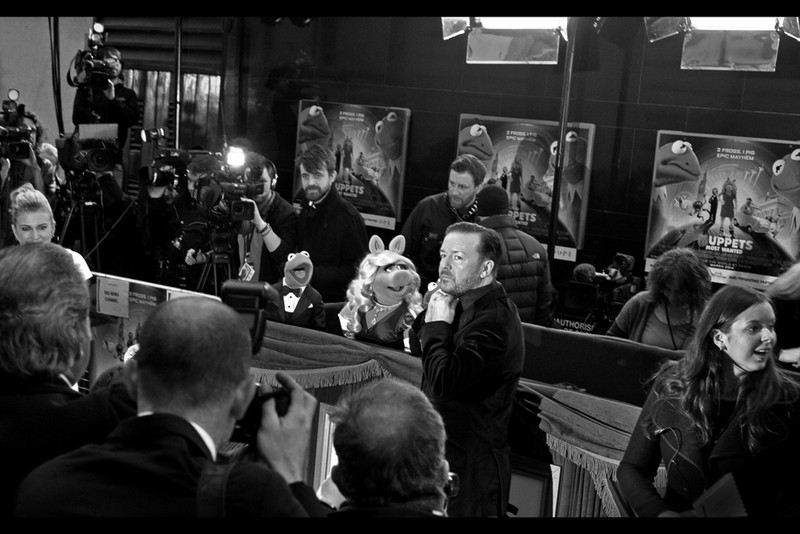 "Anyway, peace out, I gotta high-five some Muppets" at any other premiere in England, that might be perceived as an insult against autograph dealers, in which case I'd be even more supportive. "Seriously? None of you are going to interview me at all? Because I've got pizza down here I could be enjoying if you don't have any questions"
"Come what maaaaaaaaay". A Muppets version of Moulin Rouge? It could happen. Disney is pretty much buying up the rights to everything these days. I think they bought Birmingham and most of Yemen recently. "Suze, I gotta find that guy with the script. I wasn't listening and honestly thought he was saying it was *Dark Crystal* fanfiction, not FRAGGLE ROCK"
Quick question : Dutch Tilt shots - still cool, yay or nay? (I ask because it's slightly less embarrassing to ask than 'umm... who is this guy?'). He's wearing a Muppets T-Shirt so he's obviously allowed to be here... but beyond that I've got nothing. "I believe the plural of Muppet is actually Muppii?" Speaking of Very cool, here's a somewhat unexpected arrival : Stanley Tucci, who was brilliant in (and at) "The Hunger Games" last year, and remains a great inspiration to all men of receding hairlines. Now if I could just find the courage to wear thick-rimmed glasses like that (and, perhaps at times, a suit) I might also make waves and point fingers on red carpets. I'm from Australia, so I've had to rely on others to assure me that the cultural significance of Bill Oddie is greater than, quite possibly, both of my cameras and even my iPod is to my existance. I don't believe it myself, but then I'm in a land where I can't really convince anyone that (say) Ian 'Molly' Meldrum is a cultural icon. I'd love to start rumours that Stanley Tucci practices pyrokinesis, but this photo is about 5cm off. Pity. It could have helped the man start his own supervillain world-ransom scheme, if he wanted. I don't actually know who this is, but I suppose he's probably handsome in a bearded Liam-Hemsworthian way (and if that adjective doesn't catch on, I won't be too devastated). Still.. jacket top worn over a T-Shirt. I hear that's a thing, now? They must be deep and mighty thoughts if Stanley Tucci is having them in the middle of a Muppets premiere. Hopefully something more deep than what I'm thinking, which is : I'm cold and that's an awesome looking overcoat he's wearing. And on that note, that's another premiere for The Archive of Movie Premieres which is a landing page containing links to the other 200+ premieres I've done.... and another very late night to bed for me - apologies for bad grammar, bad humour, and anything that might bring down The Ire Of The Mouse.